...because we released a patch update to the CRAN version of vegan. Normally we don't introduce new functionality in patch releases but the change I made to the way users can request ordination scores was pretty trivial and maintained backwards compatibility. "symmetric", which gives a so-called symmetric scaling, and is equivalent to numeric value 3. Whilst this requires the setting of two different arguments, it's certainly a lot easier to remember these two arguments than what the numerical codes mean. Here's a quick example of the new usage showing a PCA of the classic Dutch dune meadow data set. PCA of the Dutch dune meadow data set. Both biplots are drawn using species scaling, but the one on the right standardizes the species scores. 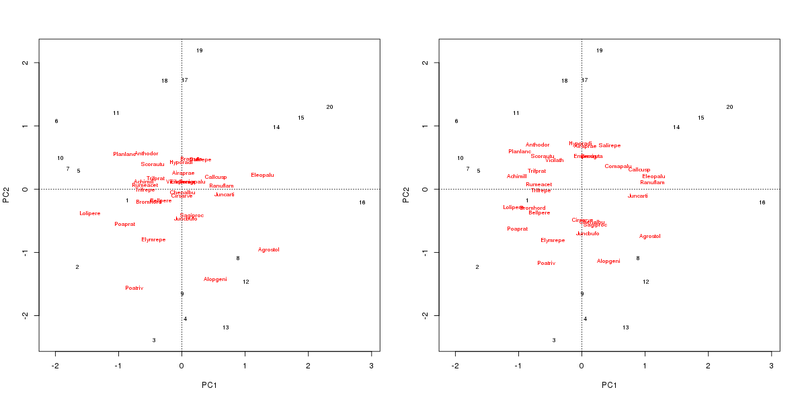 The two biplots are based on the same underlying ordination and both focus the scaling on best representing the relationships between species (scaling = "species"), but the biplot on the right uses correlation-like scores. This has the effect of making the species have equal representation on the plot without doing the PCA with standardized species data (all species having unit variance).